A new apartment complex currently in development called The Standard will offer Tech students more options for off-campus living in the heart of Midtown. Located on Spring Street between 3rd and 4th Streets, The Standard will lie just south of Tech Square. The 362,000 square foot development will consist of 257 apartments spread out over nineteen stories, with options including one to five bedroom apartments as well as studios. Residents will be able to utilize aquatic facilities as well as a fitness center, a sauna, tanning beds and a golf simulator. At street level, The Standard will feature 10,630 square feet of retail space. There are plans to completely revamp the 4th Street Starbucks that currently exists on the lot, transforming it into a vaulted-ceiling, glass-and-chrome space with a drive-through option. The rest of the space will be available to thus-far unannounced vendor occupants. Previously, the lot was home to a number of abandoned buildings and a few small night clubs, such as QUAD and Enclave. These clubs have not announced plans to reopen elsewhere. The 3rd Street Tunnel, which connected the south side of Tech’s east campus to Midtown, has been largely closed since 2008 when the eighth annual Campus Safety Walk identified crime concerns in the area. With so much new development, spaces that were once considered unsafe have been redeveloped and reinvigorated. The complex will also feature a 10-level parking deck to serve both residents and patrons of nearby businesses. 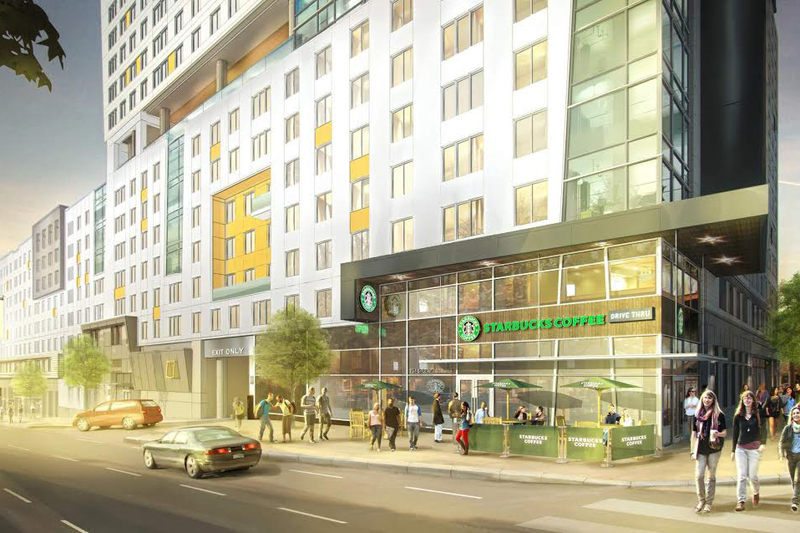 At a recent meeting of the Midtown Development Review Committee (DRC), Landmark Properties and Selig Enterprises, the developers of The Standard, were asked to rethink the proposed Starbucks drive through; the current plan involves a curb cut on Spring Street, which would reduce street parking and disrupt pedestrian flow. With Tech encompassing more and more of Midtown, this parking deck, as well as the proposed additional street parking, will assist in solving ongoing traffic issues which have resulted from a lack of parking. To promote non-vehicular transport, the DRC has encouraged a more prominent bike maintenance facility in the area, featuring wall-mounted bike parking along with bike repair equipment. This would expand upon the bike maintenance facility which has already been proposed. The developer has already opened several buildings under the Standard name, including apartments in Dallas, Knoxville and Athens. All of the developments are geared towards college students in terms of pricing. The Standard will join numerous other off-campus housing options near Tech, such as University House, Square on Fifth, 100 Midtown and M-Street.